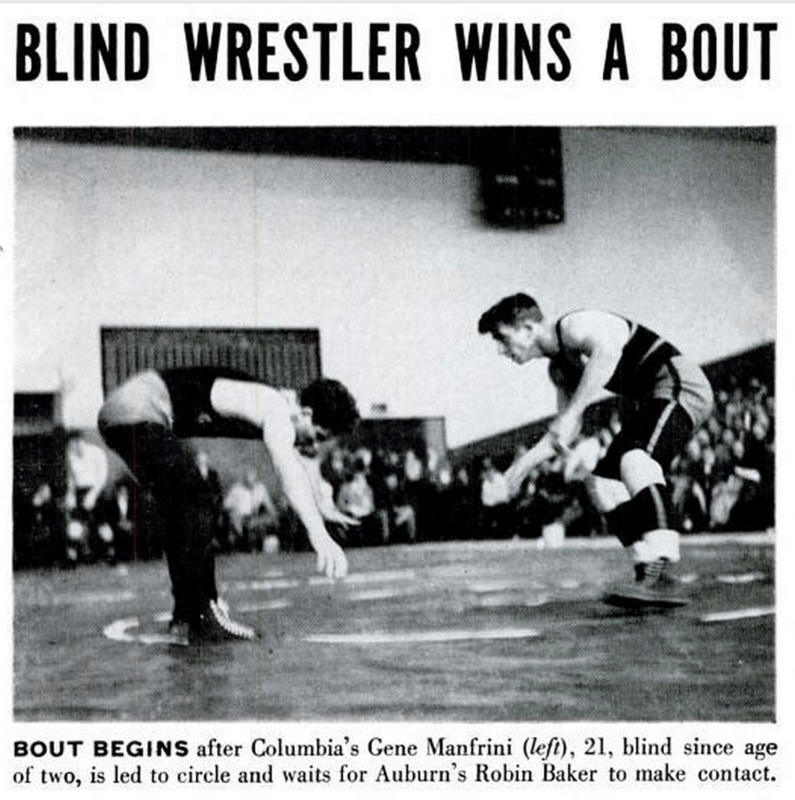 Another blind wrestler who attended New York Institute and competed for McBurney YMCA was 145-pound Gene Manfrini, who won several NY Metropolitan AAU titles, competed at the 1947 National AAU wrestling championships in San Francisco, and was a standout at Columbia University where he is featured here in Life Magazine (April 16, 1951). 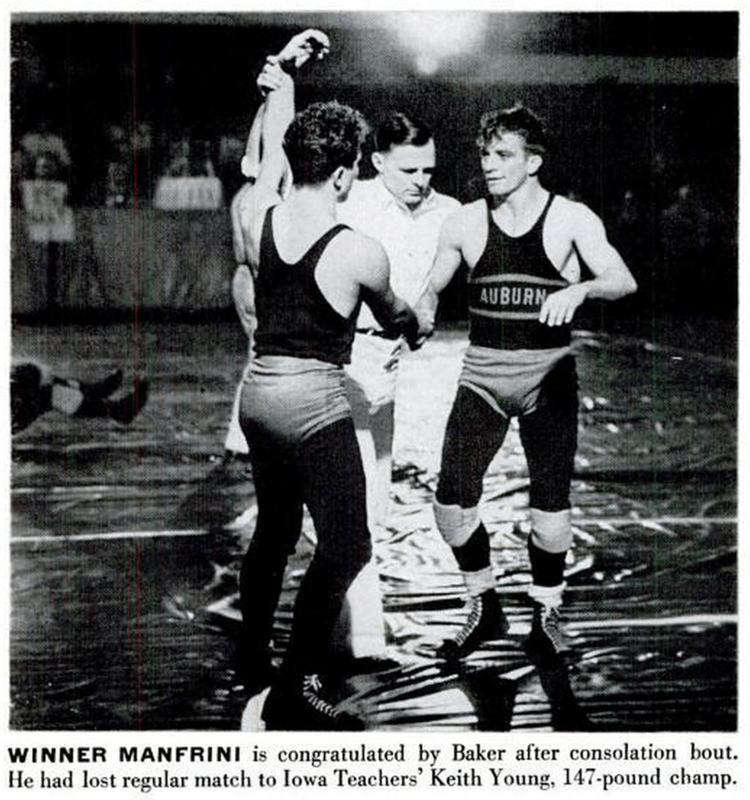 Manfrini was four years younger than Dad. These photos are from a spread in the April 16, 1951 issue of LIFE. 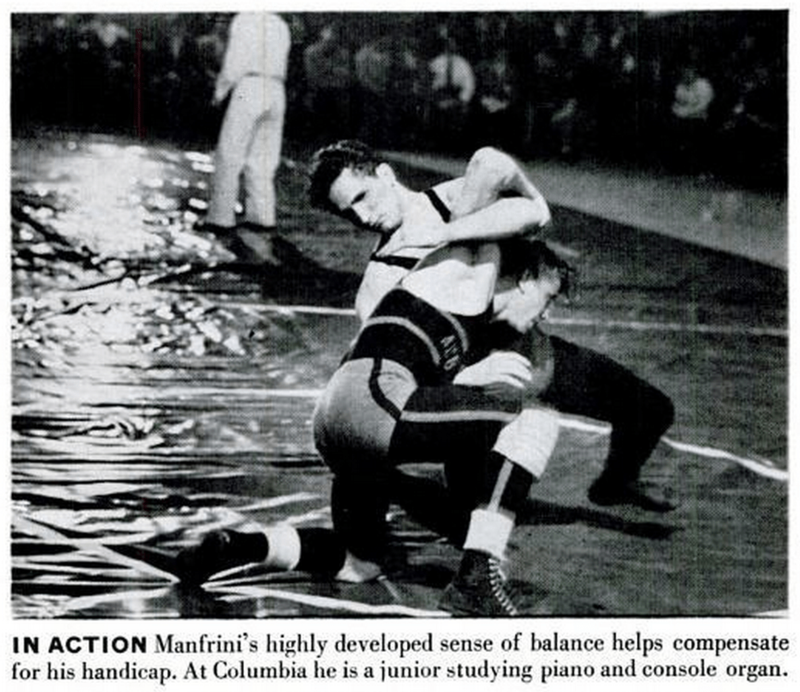 Note Manfrini’s passive, relaxed starting pose. Also note the remark about his excellent sense of balance. Manfrini may have been a bit of a late bloomer. Though he competed in the AAU nationals at age 18 and later shined while studying at Columbia, the records that I’ve found from when he was probably a sophomore at the NY Institute show him losing matches in the 125-pound class. “… He eventually built his Piano Tuning and Rebuilding business into the best in this country. His clients consisted of Irving Berlin, Horowitz, Arthur Rubenstein, RCA, Columbia Recording, Frank Loesser, Arthur Schwartz, Harold Arlen, Thelonius Monk, Dave Brubeck, Andre Kostelantz, Roseland Dance Land, Julliard School of Music, and many more. “For years, Gene had his own music group, The Mood Men. They played throughout NYC in many nightclubs. They also played in New Jersey, Lake George, and Ticonderoga. His great love of classical jazz made him well known and loved. “Until about 15 years ago, Gene traveled all over New York City, The Bronx, Brooklyn, New Jersey, and even Europe without a cane or a dog. His sense of balance and hearing was unequaled. Manfrini died 23 June, 2008 at age 79.